When little Maria wanted to learn to fish, she asked her father to take her out on the lake to teach her. Her father eagerly agreed, glad to encourage his daughter's interest in his favorite pastime. They got two rods, a few lures, and a net, then set out around dusk. As soon as the boat left the dock, Maria started preparing to cast her fishing line, but her father told her to wait, so she sat back down. A few minutes later, they had reached the middle of the lake, so she once again got ready to cast out, but again her father told her to wait. Finally, they began to get a little closer to an island about 500 yards from the shoreline. 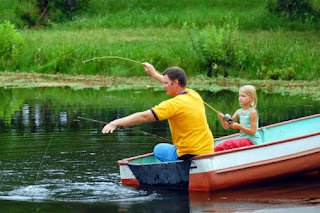 Her father cut the main motor and began to use the paddles to get the boat in a little closer. Once he had found just the right position, he turned to his daughter. Just like the fish Maria and her father sought, the customers you and your business seek are more likely to be found in certain places. It's certainly possible to run a marketing campaign that consists of broadcasting the company message across a large number of platforms in an effort to reach more people. Undoubtedly, this marketing campaign will snag some 'fish.' On the other hand, it's also guaranteed to require more resources and energy than a more targeted approach.